Self-striping sock yarn – Love it or Hate it? Hello! How have you been? It’s been a few weeks since I shot out a post. Both my mum and mother-in-law thought I was sick! But I’m fine. I’ve been happily busy and occupied. So what’s new with me? Well, I’ve picked up more freelance work and we’re going to have a new housemate in a few weeks! We’re renting our spare bedroom to a Japanese student, so we’re in a mad rush to get some renovations done. Very exciting! 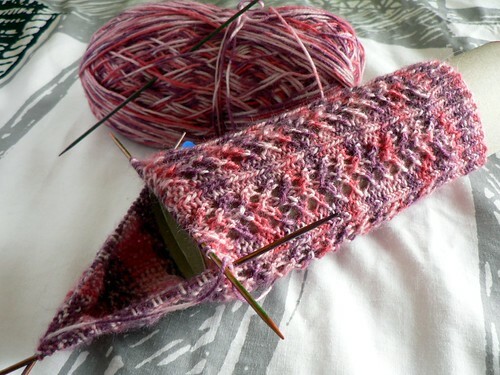 But I have managed to squeeze in a bit of knitting as always and the last few projects involve self-striping sock yarn. I’m loving it but there are down sides to this type of yarn. 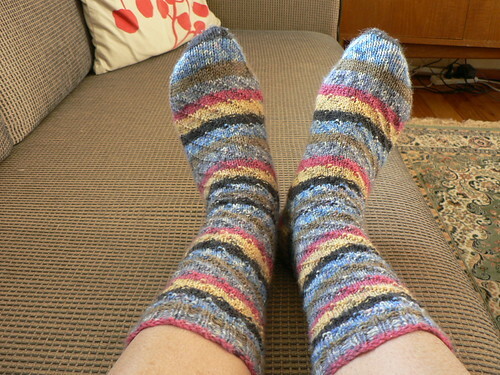 Love: Socks really come to life with self-striping yarn! Hate: The pattern gets lost among the stripes. Can you see the spirals? Love: Leftover self-striping sock yarns make a great scrappy blanket! The blanket looks more complicated to knit than it actually is. I love that I’m not in control of the colours too. A nice change to my usual uptight self. 😛 I’m changing yarn in the order I knitted the socks and knitting it until I run out. Hate: Sock yarn is normally thin so this project progresses slowwwly. Love: Self-striping yarn are not always crazy and wild. The analogous colours in this pinky yarn are pleasing to the eye. So what about you? Do you love or hate self-striping yarn? I also want to share with you my new toy. I finally bought a set of Nancy Knit Knacks’ DP WIP tubes. They safely store my double pointed needles and current project together. So handy, especially since I’m officially addicted to knitting socks! 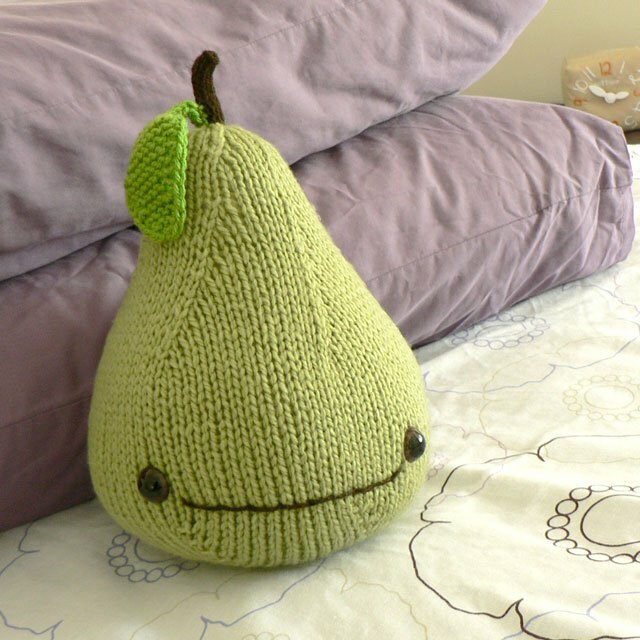 Love: I don’t have to change yarn to add some spice to the knitted piece. Plus the colors already look good together. Hate: I’m making mini mitten ornaments from self striping sock yarn right now, and it is very hard to get matching mittens. Eight mini mittens later and no 2 are a like. Looking on the bright side: I need to make at least 9 sets of these ornaments for Christmas presents, so it forces me to knit until a good enough match is made. I still saw the cool sock pattern right away 🙂 Great job! I really love the blanket. 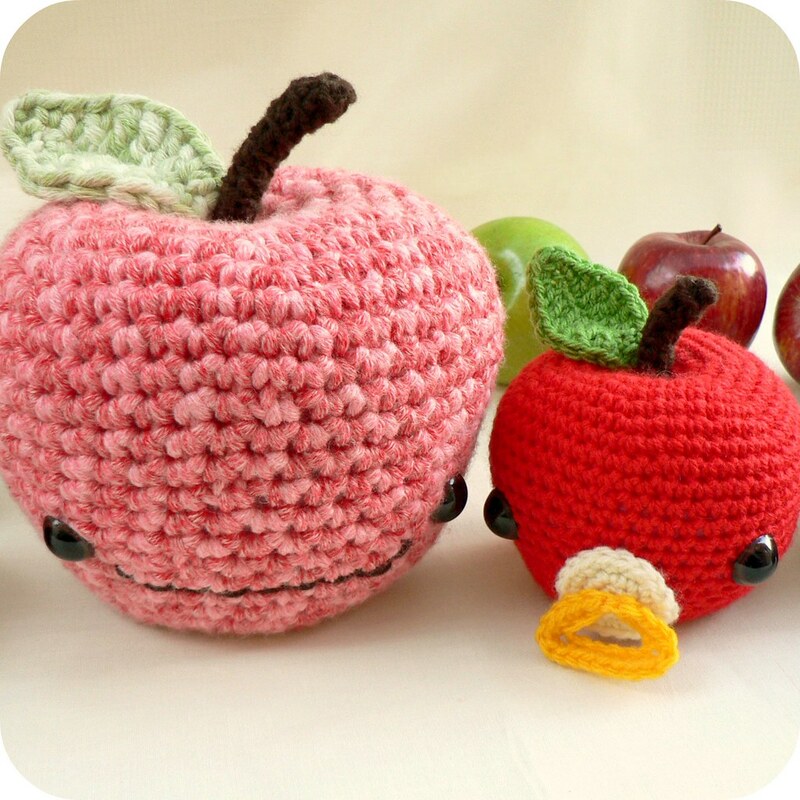 I want to try making that. .-= Kristy´s last blog ..Silver Fancy Ornaments =-. I also have a love/hate relationship with self-striping sock yarn. I kinda have the same thing with hand painted yarns. I love them and they way they look, plus I love that with self-striping you don’t have to worry about changing colors. But I really hate that the patterns get lots in all the colors. And sometimes they can seem a little too busy. But I still love them nonetheless. I hope you get everything ready for your new roommate. That sounds exciting! 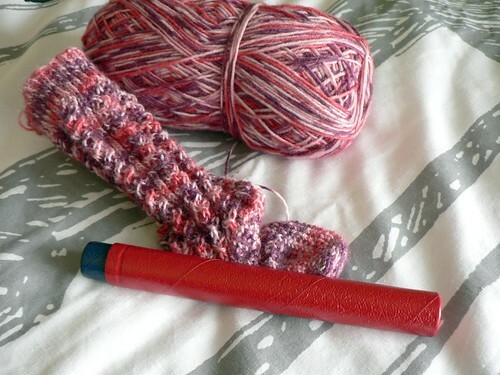 I also love the DPN holder, but have you tried knitting socks on one long circular. Try it! So much easier, faster and more comfortable (no fighting with needles getting in the way). When I first learned to knit socks, I was a DPN all the way kinda girl. Then I learned the “Judy’s Magic Cast On” (a lifesaver) and tried it on on long circular. Now I am a circular needles for socks kinda girl. .-= Cami´s last blog ..Catnip Bunnies =-. 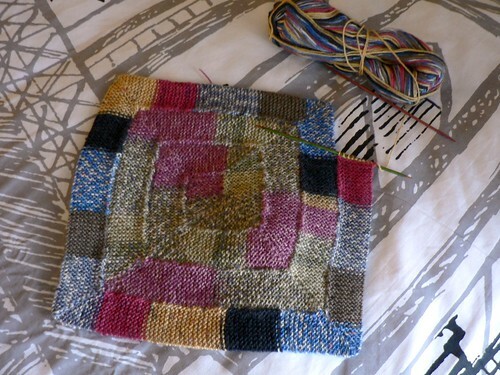 .-= janjan´s last blog ..Making- Greenleaf Baby Blanket =-. I don’t really love self striping yarn, unless its a plain sock pattern, I prefer solids and semi-solid colours, they really show off the lacey patterns better! Yes, I can see the diagonals — once you pointed them out. But I’m sure if I saw the socks in person, I’d see the pattern more clearly amidst the stripes. You did a great job of making nearly identical rather than fraternal socks, by the way! As for storing sock needles with a sock project on them? Another great tool are Rollie Stitch Keepers. They’re little rubber cap ends on an elastic cord that fit over each end of the needles. They’re very nice; I use them exclusively now. In fact, when I showed them to the owner of a new LYS in my area, she was so excited she immediately ordered a bunch, so apparently I’m not the only person who likes them! Have fun renovating, and I hope your Japanese student works out well as a housemate! Your socks are beautiful!!!! I love them. I tried to learn to knit socks but I am way too stupid to understand the patterns haha. Take care dear friend. Oh by the way, I gave up the citizenship. I love that blanket piece and would love to know how you’re doing that, particularly the corners and then getting it to connect all the way around. As far as striping sock yarn, I love buying it, but since I hate knitting socks, I hardly ever use it. Just admire it in my stash 🙂 That blanket would be better fit for me. I love self striping sock yarn but always feel like I have to do just a simmple stockinette sock cause the colors are the main things. Any pattern I try to do gets lost in the stripes. Welcome to the sock side!! .-= Nadine´s last blog ..Lavender Blue Farm =-.